What do you do when you have to make up your mind, but it's just so hard to find the right decision? Some use Pros and Cons lists. Others leave it to faith and flip a coin. Or look for signs to tell them the answer. Ask their friends. Ask their parents. And most of the time still end up not knowing what to do. But now, there comes an app that can help make decision making easier. This is Mmmh, and you can get it from the AppStore. Mmmh helps you make up your mind, by encouraging you to weight your options taking into account multiple aspects and their value. For every question you are trying to find an answer to, all you have to do is choose your own options and grade them according to your own criteria and their value. It might sound complicated, but in the end it's pure Math, only that you put in the numbers, and Mmmh resolves the equation for you, indicating the best decision based on these simple calculations. Okay, so quick example. Let's say, you have a really busy day today. You have a ton of work to do. Your best friend, whom you haven't seen in weeks, has finally called you to get together. You also have a doctor's appointment. You promised a mate to meet her for coffee to give her some papers. And you also have some chores to do around the house. One option would be to try and do everything and please everyone, risking to end the day completely exhausted. But, better yet, you can consult Mmmh and choose to only do the first 2 or 3 activities that get the highest grade. At this point, you have a question and multiple answers to it, which makes the decision hard to make. So, turn on Mmmh, and add a new decision. 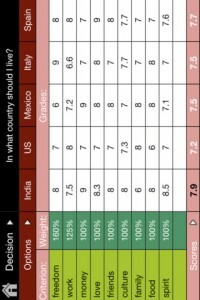 Write your question, add your options and select appropriate criteria to weigh your options. In this case, some of your criteria could be: urgency, pleasure, outcome, cost, and any other factor you consider important in making the best decision. Once you're done with all this, pick a percentage for every criteria, depending on its value to your decision, and you are ready to grade your options. As you add your grades, Mmmh makes the necessary calculations, and by the time you're done grading, you'll know what's your best choice. If you still don't feel you're making the right decision, you can reevaluate your grades and criteria. 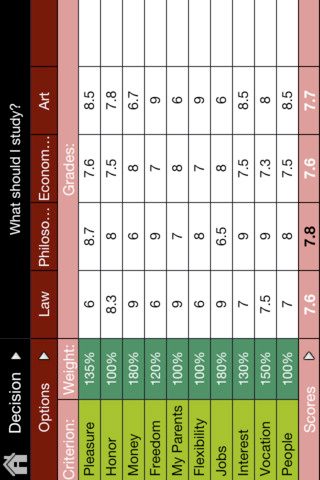 Or, you can add a whole new set of criteria and grades with a single slide of the screen. When you're done, all that's left for you to do is to actually make your decision, and then you can add a new question to Mmmh and let it help you make yet another good decision using the same logic. All in all, Mmmh doesn't make decision making as easy as crystal balls, flipping coins and other similar methods, since you do most of the work. 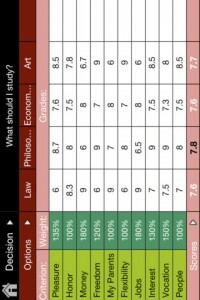 You add your options, your criteria, the values and grades. All Mmmh does is apply a simple algorithm. But it's worth the effort. Because it's probably one of the most accurate methods when trying to make a decision, and it's definitely the most logical of all. What do you think of Mmmh ? Scroll down for our comment section and let us know!